Let the best workbench win. Below are a few modules for your consideration. There are more. The modules presented below are about 3 feet wide. We have a large selection of cabinets that are 2 feet wide. See Products for a full listing. Click on any module below for details. 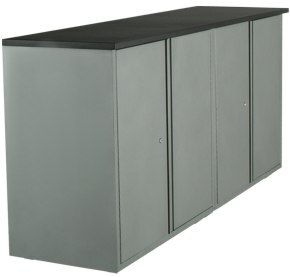 Choose from over 35 modular cabinets - each fully assembled. They simply stack to provide the ultimate workspace and storage solution. Other cabinets from overseas arrive flat and are assembled with pins. Our cabinets are made right here in Canada - where they have been for over thirty years. They are welded for lasting strength and uncompromising durability. Store everything from electronics to power tools. There are cabinets with drawers in every combination imaginable, cabinets with doors for basic storage and then there are pullout cabinets. This is where you get to design a cabinet with mini drawers, pullout shelves or stationary shelves and you decide where they go. Space the mini drawers close together for hand tools or further apart for paint cans. Position a pullout shelf for your laptop or for drawings or simply as an additional work surface when the top is full. Go Configure! 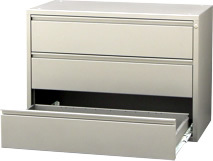 Pullout Cabinets have a series of slots that accept our optional shelves and mini drawers. Sliders or brackets snap into slots in the cabinet, shelves and drawers snap onto the sliders or brackets. 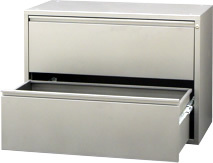 The FDCAB14 and FDCAB20 Pullout Cabinets are available with or without a garage style flip door. 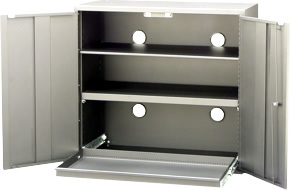 Taller Pullout Cabinets come with hinged doors, rather than flip-doors. Shelves and drawers are sold separately. Although you can use the cabinets to reach that perfect height you can also fine tune the overall height with legs. 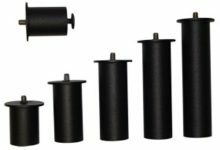 Screw-in legs, available in metal or wood, simply replace the levelers at the bottom of Can-Am cabinets. This is also useful to lift the cabinets off the floor for mopping floors or in the event of water intrusion. Legs are available at 2", 3", 4", 5" or 6"
We Canadians do love our cottages - and some of them are not that easy to get to. No worries there. Can-Am cabinets are modular - infact most modules will fit in your car. 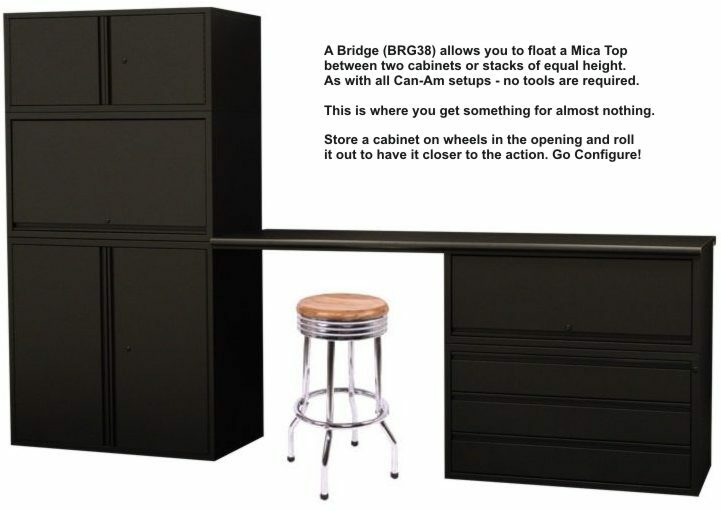 While we are thinking about the cottage, lets not forget about the other rooms that would benefit from Can-Am cabinets. 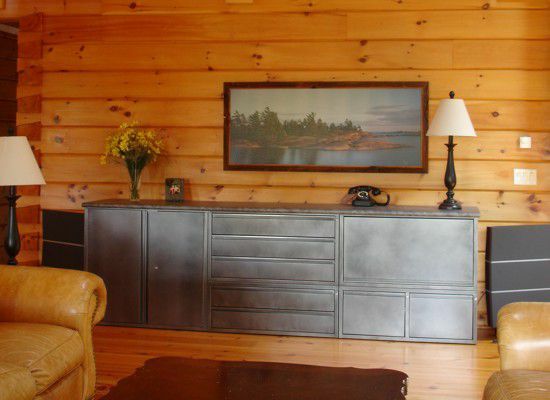 Metal will compliment the wood suroundings perfectly, so if you need a dresser in the guest room or a TV stand in the great room - you've come to the right place. Go Configure. Can-Am cabinets are 100% steel, completely recyclable and will never end up in a landfill. And best of all they are made in Canada, so they didn't have to travel across the globe to get here.The rich powder coat finish is VOC free and hypoallergenic with zero emission. 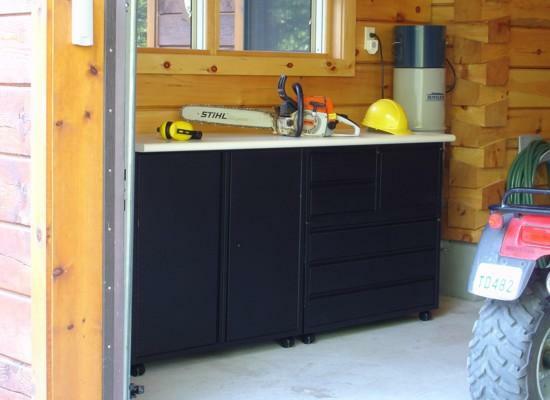 Can-Am cabinets should last a lifetime or two, so relax, choose your color and enjoy the best workbench money can buy. The only thing the next generation will have to worry about is who gets to keep it. Click to see colors. You get what you want - wherever you want it. Move your workbench or tool storage station as required. 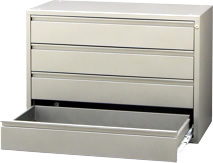 Our heavy duty caddies will carry your workstation or part of it - wherever you want it. There are a number of accessories available. Customize your cabinet with a variety of accessories. Click on an item for details. 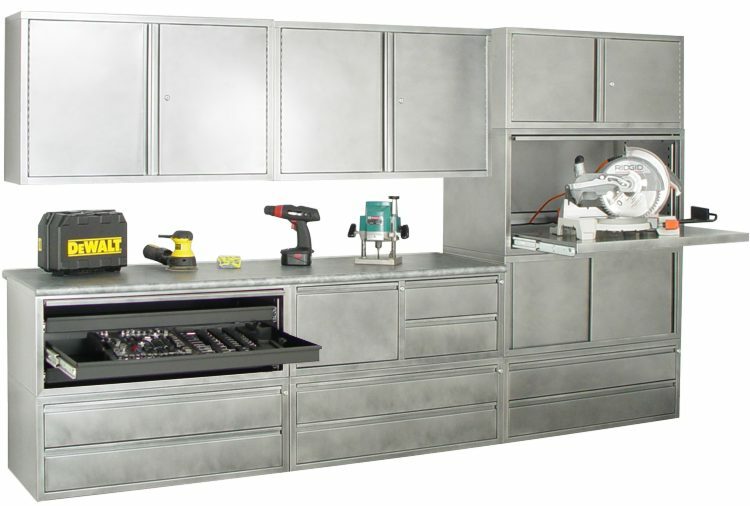 Configure & Price Your Workbench With This Drag'N'Drop Design Tool. Don't just imagine the perfect setup. Design it yourself. Choose an item from the drop-down menu. Use the scroll bar to see all the items and click to make your selection. Hold	down	your left mouse button and drag items to the location you want, then release to place or reposition them. To remove an item once you have placed it, drag the 'remove icon' onto the item you want to remove. To clear all items and start again, click the "Restart" button. "Open / Closed" toggles between showing all pullout cabinets outfitted with doors - open or closed. 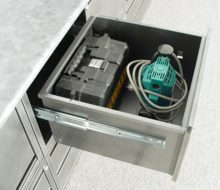 "Snap ON/OFF" disables the snapping function, which is useful when mixing standard width and narrow cabinets. To determine your total cost, including shipping, click the "What's My Cost" button. Our Worksheet Form will open in another window with your configuration pre-loaded. You can then switch back and forth between these pages. Select your State, so that your total can be automatically calculated! If you would like to save a copy of your creation, print this page. Here's a twist. 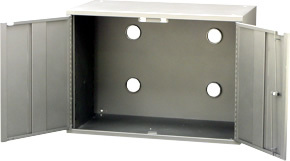 We started out building cabinets to store videos and DVDs in video stores. Then we made our way into living rooms and board rooms. We are now the world leader in high density CD & DVD storage - serving governments, corporations and collectors all around the world. Many of our customers appreciated the strength of our cabinets and turned to us to outfit their garages and shop floors. you will like us enough to welcome us into your living room and office. Go configure! Can-Am can help. Call to speak to one our designers.